In 1984, Bask and his family immigrated to the United States from Czechoslavakia (the modern day Czech Republic). He is known in the Florida area and beyond for his texturally-magnificent works which are often displayed on salvaged materials. 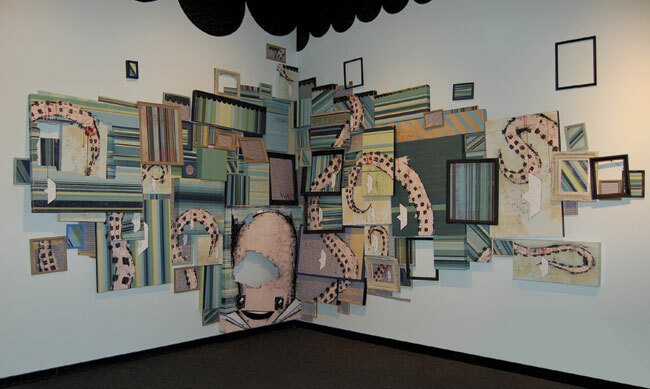 Everything from old wood scraps to wallpapered panels are fair game for the art takeover of Bask. What other people might consider trash is just the launching point for Bask’s artwork. When we last spoke to Bask over a year and a half ago, his work was largely motivated by political and social issues. They featured huge amounts of iconic commercial figures and symbols, for example, the Morton’s salt girl or dirty ol’ Linus from The Peanuts. At that time, Bask didn’t think much about the closure of the coffee shop and was simply excited to have found an interesting new panel to paint on. But when he returned to Miami months later, he saw that a brand new Starbucks had opened in the location of the old Harvey’s, and it made a significant impact on him. Although Bask does not seem any less politically or socially-aware now than he was before, his works have changed through the years — in context and in influence. But in some cases, sometimes a message is on the tip of Bask’s tongue, waiting to be heard by the world. We were lucky enough to have Bask custom-design the cover of this issue for us, and as a fan of all types of music, he was clearly inspired by injustices in the music industry when he created this piece. The art features a vintage-style man who looks like a stereotypical corporate fat cat. He is donning a suit and smiling cheekily while a cigar pokes out from through his teeth. On the man’s hand is a scraggly puppet he is controlling; the puppet wears an anarchy t-shirt and is waving flags that say “indi” on them. It’s a clear and forceful message. Bask’s pieces frequently have a decayed look to them, and the amount of detail in every nook and cranny of his work is sometimes hard to keep up with. His pieces look like they’ve been weathered for years, and the paints crack, blister, and peel with personality. These effects, coupled with the use of bright colors and innovative thinking, help Bask’s work command attention in the streets as well as in the galleries. It is sometimes difficult for artists to find venues that have their best interests in mind, but Bask believes that with enough perseverance and patience, any artist can find those galleries. And as for the ones that might not look as kindly upon his work as he’d like, he has no qualms about them. To him, it seems simple. Artists need galleries to hang their work in. Sell yourself. Bask has not found much difficulty in finding galleries in where to show his street- and graffiti-influenced work. As far as he can tell, street art is becoming more and more mainstream. You use a lot of commercial references in your work. Why? What does this have to do with growing up and noticing the similarities between communistic propaganda vs. commercial icons? I use commercial images as metaphors or symbols of contradiction in scenarios playing out in my work. The other purpose they serve is as bait to viewers who identify with a particular icon being used. I use the power of familiarity and twist them to deliver a message of my own. As for the communist and commercial comparison? They both use very similar tactics using images to promote a way of life. In capitalism, you have choices, but each individual brand pushes their product the same way a totalitarian regime pushes propaganda. When did you first find a correlation between communistic propaganda and commercial icons? When I first started incorporating brand icons into my work, I started to notice how people would react to certain paintings of mine. That’s when I saw a very specific relationship between commercial images and regular folks. I started to recognize the power of “the brand,” and their collective messages to consume, consume, consume. In the Communist regime I grew up in, the message was different, but the way propaganda was relentlessly promoted through the media was very similar. I think “conscious” would be more accurate than political. A political person, to me, is someone active in anything from protesting to running for office. Although many of my paintings are political, most of my work deals with more personal and social issues. What advice can you give artists who are trying to get their work out independently? I’ve never taken a crash course in art promotions, and have kind of worked on intuition. The secret formula is to be consistently productive in all things involved with your art, and don’t be lazy. The other advice I would give is: make your own opportunities, instead of waiting for them to find you. What was the first art piece you remember doing that people took notice of? I think when I used to make little handmade holiday cards for my family as a child. The satisfaction I got after presenting my toiled mess to someone and making them smile was the best feeling ever. Your works definitely use a lot of textures. Is the love for textures something you’ve always had? Did it emerge naturally from being a street artist first? Doing street art definitely shaped my approach my art, which would include how textured my work is. Aside from how appealing textured surfaces are to me, what I really enjoy is the challenge of painting on them. It makes it look more like art to me, rather some manufactured promotion. What is the message behind your street art, and what do you think of random graffiti that does not put forth a message? The Bask In Your Thoughtcrimes campaign promotes free-thinking and the separation from the status quo. The word “thoughtcrime,” as you may well know, was first coined by George Orwell in the book 1984. I found this word very fitting and appropriate to the message I was trying to put forth. As for other graffiti, I love it. I love all forms of street art, be it a commissioned mural or a tag on a dumpster. The art is the message when it comes to street art and graffiti, and to me, there is no higher art then it. Can you pick one of your pieces and explain it? I made [“Harvey’s Cafe”] from a panel I took from a coffee shop that went under in Miami. I don’t live in Miami, so I never had a chance to visit this place. Now, I’ll never get the chance. From what I could gather, though, it was as mom and pop as you can get, and had been there for years before closing. At the time, I didn’t give it any further thought beyond [the fact that] I just found a great panel to paint on. A few months later, I returned to Miami and saw that a brand new Starbucks had opened in the old Harvey’s location. We all have heard and seen examples of large corporate chains pushing out the little guy, but this case hit home with me, and I didn’t really know why. Maybe it was the change of guard switching out one humble little coffee shop for the bigger, better new one, or maybe it was the fact I actually had a piece of Harvey’s in my studio like an old fossil, [as] proof that it once stood. REDEFINE stands for a lot of the things that your “bask in your thoughtcrimes” mentality does. That being said, it seems similar to your mentality of non-conformity. Want to give our readers a message of sorts in your own vein? I guess I would quote slogan coined by Joseph Campbell and tell your readers to “follow your bliss.” Non-conformity is a state of mind, so as long as you wake up every morning and love what you do, then, in my opinion, you’re winning the game of life. Not everybody can play a guitar or paint a picture, but everybody has individual hopes and dreams that can be achieved if pursued.